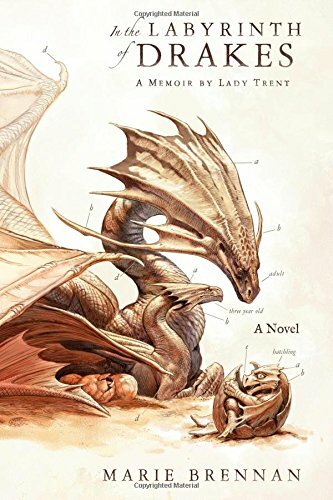 Isabella, Lady Trent's adventures continue here in this fourth book of the Natural History of Dragons series, where she finds herself sent to Akhia, a place somewhat like the Egypt with shades of other middle eastern cultures, to figure out how to raise and breed dragons. The nations are on the brink of war, and her own government wants a reliable source of strong and light dragonbone that is not acquired by denuding the world or hunting wild populations. The scientist first in charge of the project got nowhere, and she'll either figure it out, or she'll take the blame for its failure. She's already something of a scandal, being a world-traveling scientist-explorer woman in a basically Victorian, tightly laced, and masculine society, so she's a good choice for scapegoat, and she knows it, so she's determined to succeed. While in Akhia, she's reunited with her friend Suhail and discovers who his people are. She faces the desert weather and the rebellious tribes that live there. She navigates politics and scientific problems alike. She explores ancient archaeological sites and natural wonders. And she sets up a good start to a program that will likely take years to make any headway. She works with dragons and honeyseekers, people and camels, and it's as fun to read as if these were actual dispatches from the field. As a memoir, the book is told from Lady Trent's own point of view, but from many years after the events in this volume, so she's able to give context about how things happen both before and after the events she's talking about. The book doesn't lose the intensity of the story itself despite the time and tone jumps; if anything, being framed as a memoir opens the scope and lets her explain facets of culture and history that she didn't understand at the time of the events, but that have bearing on the story. Often, her asides and mini lessons are some of the most interesting parts in the book. In the Labyrinth of Drakes reads partially like a good old adventure tale—there's much struggle and travel and discovery, several assaults on her person, a gorgeous palace and a Caliph, and it's told through the eyes of what is essentially an English woman abroad. But Isabella is a scientist, balancing the sensationalism of her story with science that feels real even when she's dealing with creatures we don't have in our world. She makes a point to address the worst sorts of exoticism that happens in the original Victorian stories these books are modeled after, by way of correcting rumor or bad press her adventures have gathered. There's even a little romance, charmingly both sweetly old fashioned and cheerfully unconventional, though the dragons are the ones that take up most of her focus, and they're fascinating through her eyes. She's a tough, strong, easily frustrated but never mean protagonist, smart and capable and more than worth following through this fourth book in the series. By the end, they make some discoveries that should make the next book even more fascinating. These books are set in a very realistic fantasy world. It feels like historical fiction, full of details and realism that could have been out of any travel journal from the age of exploration. The people and places could be from our own world's past, despite the addition of dragons that makes everything a little more adventure focused. And the main character talks all the time of things that happened in previous books, as real people do, comparing similar events, taking lessons from her past experience, applying what she learned before to what she's faced with now, and that, too, adds reality. But the borders of her world aren't really like ours, and the histories the current countries and cultures are built on are ancient and probably closer to a classic epic fantasy, lending depth and weight to the story, too. The locations are so clearly described and so reminiscent of actual awe-inspiring places, that the book is a joy to read. The scene setting almost makes the reader into part of the story—casting you as the reader back home in her own land who the book is written for, and so putting you into the world as you read it. It's a clever, exciting, informative book, sure of its characters and its world, and striking out in new directions further into that world in every chapter. May all of them be as fun to read as this one!